Bruce Adams is best known as a conceptually based figurative painter who references various painting styles. In exploring the act of painting, Adams peels back the layers of meaning inherent in art making and viewing. He has exhibited extensively regionally and internationally, and his work is included in numerous private, corporate, and museum collections including the Albright-Knox Art Gallery, Castellani Museum, UB Anderson Gallery, and Burchfield-Penney Art Center. In 2007 Adams was given an extensive mid-career survey exhibition titled Bruce Adams, Half Life 1980-2006 at the UB Anderson Gallery. In 2016. His most recent completed body of work titled Myths and Lies was exhibited in a solo exhibition at the Castellani Museum in 2014. 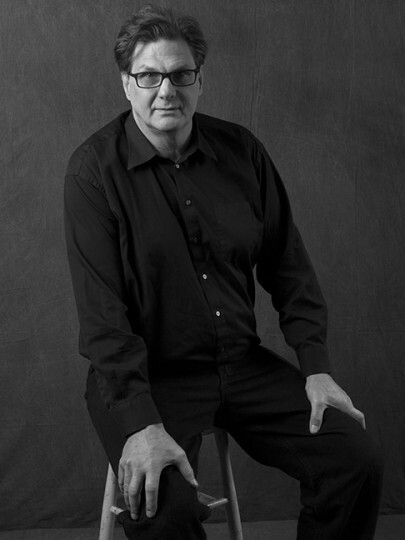 Formally trained in art education at Buffalo State College, Adams extended his education through his long involvement in the contemporary art scene starting in the nineteen-eighties as director/curator of peopleart bflo gallery, and then with Hallwalls Contemporary Art Center as an Artist Advisory Committee co-founder, long-time board member, and board president. Adams’ experience includes work as a painter, installation and performance artist, educator, arts advocate, and award winning critical writer. He was selected as a participant in the NYFA MARK Professional Development Progam.. and the MARK Consultants Program. He is a lecturer at Buffalo State College. Adams’ installations and performances have been staged in public venues such as Buffalo’s First Night, the Urban Art Project, and most notably the Artists and Models Affair. The first thing you notice is that each series of paintings look different. That’s intentional. I prompt contextual associations through references to historical painting. I am also frankly just too restless to stick to one signature style for my entire career. Though most of the work could be described as figurative, I don’t think of my art as being about the figure (except occasionally in allusions to history). Instead, each series is conceptually driven. That is each group of work begins with some idea or premise that plays out over the course of the series, often evolving and taking side trips along the way. I tend to build concepts in strata, heaping on layers of meaning, acknowledging layers of separation. I don’t tend to think of individual paintings as discrete works. Rather, I visualize the group of work as a unified whole that is best appreciated when seen together. That’s why I include everything here.